Learn the basics about net-zero homes that may give you a few ideas about making your home more efficient as a whole. The lowdown on net-zero homes. If you're on the hunt for a more efficient, sustainable place to live, a net-zero home may be the way to go. It's on track to be the way of the future, with many jurisdictions around the world looking at incorporating net-zero construction standards into residential building codes. A net-zero home generates as much energy as it uses, so the net amount of energy it purchases from the local hydro company is zero. It's a new idea that's gaining popularity as people become more interested in having a home that is more comfortable and resilient, and also reduces costs to their pocketbooks as homeowners. 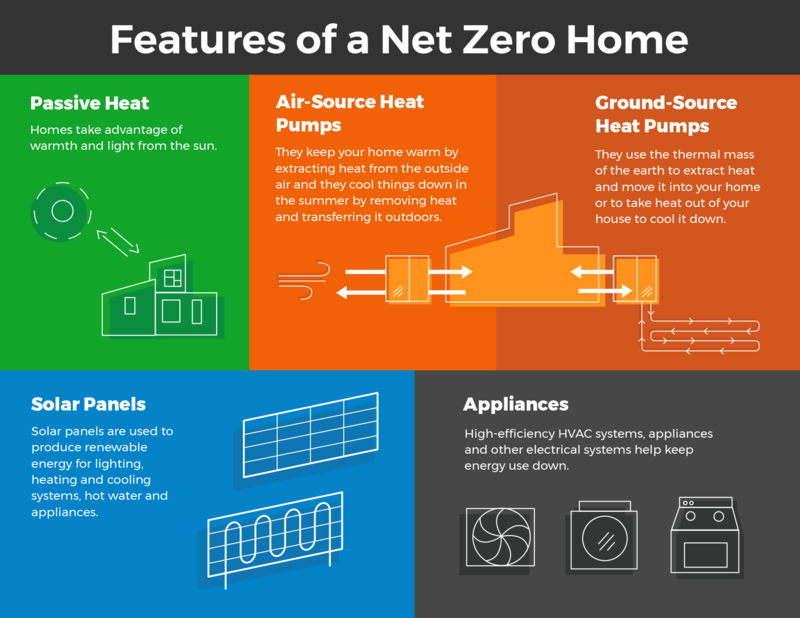 What makes a home net zero? Net-zero homes are designed to be up to 80 per cent more efficient than conventional homes, so they require less energy to begin with. They can be oriented to take advantage of warmth and light from the sun, known as passive heating. They are also built to be exceptionally airtight and insulated with additional layers to retain heat in the winter and keep it out in the summer. High-efficiency HVAC systems, appliances and other electrical devices help keep energy use down. Homeowners also manage their energy use carefully, being mindful of how energy is used around the house. Net-zero homes also feature on-site energy generation that is capable of producing as much power as the household uses in a year. How do net-zero homes produce energy? Not every net-zero home is the same, but they all include their own sources of renewable energy. Many use solar photovoltaic panels that can typically produce energy for lighting, heating and cooling systems, hot water and appliances. Energy from solar panels can be stored in a battery for use later, or sent into the local electricity distribution system and sold to the local hydro company. Net-zero homes also use highly efficient heating and cooling systems, such as air-source and ground-source heat pumps. Air-source heat pumps draw in outside air and warm it during the winter, and pull warm air outside the house during the summer to keep it cool. Ground-source (also known as geothermal) heat pumps use thermal heat from underground to warm a home during the colder seasons, and pump heat outside during the summer. A net-zero home can still be connected to the electricity grid, so it can meet changing household energy needs throughout the day and year. For example, being connected to the grid allows homeowners to tap into electricity available from their local hydro company at times when solar production is low, during emergencies, or when maintenance or repair of energy systems are needed. What is it like living in a net-zero home? People who own net-zero homes typically find them very comfortable. When a home has highly efficient windows and insulation, it often feels warm without much heating, even on the coldest days. With good insulation, heat is also better distributed around the house. Sometimes the warmth from appliances and home occupants is enough to be comfortable inside. You also won't experience any drafts in a net-zero home. They are tested for air leaks to ensure outside air doesn't affect indoor temperatures. They also use energy recovery ventilators to preheat or cool incoming fresh air. Can an existing home be retrofitted to net zero? The net-zero concept isn’t limited to new builds. While it takes some planning and changes to conventional renovation approaches, it can be done. Following the same principles for net-zero new homes, renovations include improving existing insulation levels to exceed code standards, orienting windows to work with the sun, redesigning HVAC systems to be as efficient as possible, and installing the energy-generating technology that would work best for the building and its location. Simply put, it’s a net-zero house without the generation. It’s so efficient it could become fully net zero once renewable energy generation has been installed. For prospective homeowners, it’s a sign that a home is up to 80 per cent more efficient than the standard building code. A variety of different home energy performance standards are available to make your home more energy efficient. These standards are compared to building code, where a net zero home's energy performance is 100 per cent better than homes built to code. These structures follow the same principles as net-zero homes. In fact, with less outside wall area, it’s easier to make them efficient. They also benefit from shared HVAC systems and energy systems that can be even more efficient and cost-effective. The Canadian Home Builders Association has a net-zero labelling program to provide consumers with the confidence they need to build a net-zero home. It also offers a wide range of informative resources, including a list of professionals who can help you plan your net-zero renovation or new build. Learn how to optimize your smart thermostat.